Ignatius L. Donnelly, a U.S. Congressman who served in the 1860’s, was ahead of his time on a number of significant issues, including women’s suffrage and education for freed slaves. This may have been why his best-known book, ‘Atlantis: The Antediluvian World’ was so savagely attacked by critics, just as Immanuel Velikovsky’s ‘Worlds in Collision’ would be similarly attacked upon its publication 68 years later. Donnelly accepted Plato’s dialogues ‘Timaeus’ and ‘Critias’ in a historical tradition rather than following the allegorical interpretations of Renaissance writers. Donnelly accepted that Atlantis had been destroyed in the same event that led to the ‘Flood Story’ in the ‘Book of Genesis’, and that its sudden annihilation by earthquake, flood, and volcanism actually took place. Plato said that it had happened 9,000 years before he recounted his story, “acquired directly from Egyptian priests” (approximately 2,400 years from today). In a somewhat condescending criticism in ‘Worlds in Collision’ (page 147), Velikovsky claimed: “There is one zero too many here.” as he sought to include the destruction of Atlantis into his own timetable of more recent catastrophism. It wasn’t Plato who was mistaken, however, and his date for the catastrophe should be compared to the one I have offered, 10,500 years, or perhaps slightly more, based on laboratory analyses. I believe Atlantis existed “…beyond the pillars of Hercules” (Gibraltar) as the Egyptian priests had recounted to Plato. This would place it in the vicinity of the Azores, on the mid-Atlantic Ridge, just as Iceland is also situated on the Ridge. Whatever the truth about the details of Atlantis, which has been distorted with mythology over fifteen centuries, and nonsense in modern times, I believe that the essential story of Atlantis is true. “In a terrible day and a night (Plato), assailed by earthquake, flood and volcanic activity, Atlantis sank beneath the sea, which had changed to stone.” The stone was pumice, which floats, expelled from volcanos and vents along the mid-Atlantic ridge as Atlantis sank beneath the waves, following the impact of the asteroid 5,600 kilometers (3,500 miles) to the southwest. It has been supposed that Atlantis is merely a myth and that sudden, spectacular advances were made in agriculture, technology, and many other fields, in Egypt some 10,000 years or so ago. It is more likely that survivors from Atlantis and from outposts on the mainland – ancestors of the Pharaohs and their people, ended up in Egypt’s fertile Nile Delta, where they continued to practice and develop technology that was already known to them, and where their priests kept the history of Atlantis alive. Every society on Earth has its Flood story, for this was the greatest catastrophe to have taken place within the memory of humankind, so it is not surprising that its story was passed down for half a thousand human generations. What is remarkable is that so few modern scientists accept it. The biblical story of Noah and the ark is a fable, but the story of the flood is a legend based on real human experience. The religion of the descendants of any human survivors of the next major axis change will incorporate stories of that catastrophe. Some of the first geologists were religious fundamentalists who traveled around England examining the rocks and seeking confirmation of the Noachian flood described in the ‘Book of Genesis’. 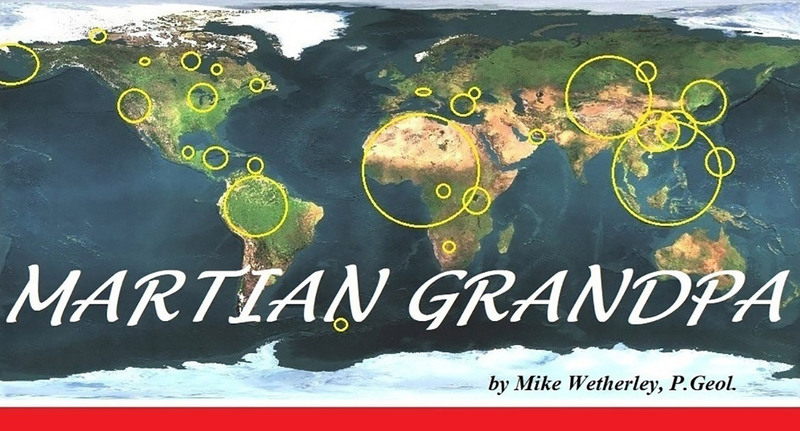 Because numerous worldwide floods have occurred, they recognized the evidence everywhere they looked and concluded from this that the Bible is right. At the time, a growing secular movement was drawing its members away from the traditional teachings of the Church and promoting the idea of free thought. That the religious scientists (today, they would be called Creationists) were claiming the Bible was right was anathema to secular scientists, who took the position that there had never been a flood. Astonishingly, in the face of overwhelming evidence to the contrary, that remains their position today. Inertia is the tendency of matter to either remain at rest or to continue in uniform motion in a straight line. When contemplating a large axis change, consider the inertia of an ocean. It has a rotational velocity at the equator, of over 1,000 mi. (1,600 km) per hour, while at the geographic poles the rotational velocity is zero. Clearly, the potential of an oceanic flood to scour the land, or to bury it with sediments, can be immense. Furthermore, if a duration of 40 minutes (which is what a longitude change of 100 suggests) was required for the poles to move 1,650 miles (2,650 km), the rate at which the change took place along the meridian of maximum change was 2,475 mi. (close to 4,000 km) per hour! Although water would lag behind, this describes an incredibly destructive force. It should be kept in mind that the change over most of the world was less extreme, with two points on the Earth’s surface not changing their latitude and longitude at all. Of course, if one or both points are in an ocean, there might not be much reduction in the violence experienced there. At an axis change, continents plunge beneath the oceans, and floods that are kilometers-deep roll over the continents. Vegetation and animals are swept away, and overburden scoured down to bedrock. Water can also be dragged north or south to where its rotational velocity is inappropriate for its latitude, further increasing its erosive power. It is common to think of Earth as being spherical, but the flattening at each pole is more than 21 km (13 mi. ), which is almost 2½ times the height of Mt. Everest above sea level. When these Polar Regions are rotated to lower latitudes, low lands immediately fill with water. Thousands of years are required for Earth to regain its preferred shape. As this takes place, the displaced geomagnetic poles move slowly closer to the geographic poles, and the total magnetic field strength, having increased at the catastrophe, gradually weakens again. Unexplained bulges on Earth’s surface may be the result of axis changes or close encounters, that haven’t yet healed. The last flood submerged animal species that would never live on Earth again, burying large mammals along the Arctic coast with mud scoured from the depths of the Arctic Ocean. This mud was below the freezing point of fresh water and was free of aerobic bacteria so that frozen remains of the animals are well preserved to this day. The presence of these remains does not prove the animals ever lived in that area, and where their remains are numerous it doesn’t prove they lived in large groups. At the other end of North America, remains of saber tooth tigers are found at La Brea, in California. They could not have simply got stuck in the tar or they would be well preserved! Well, yes, we know that their bones are well preserved, but their bodies were typically torn apart as they mixed with water-degraded petroleum from a major oil release along the California coast. Perfect skeletons have been prepared for display because so many bones are available, but it is unusual for one to be completely made up from bones of the same individual. Notably few herbivores are included in the formation because the flotation characteristics of dead herbivores differ markedly from those of dead carnivores. Dead herbivores floated away as methane from rotting vegetation collected in their bellies, while dead carnivores sank into the thick, degraded oil. La Brea is much more than just a collection of tar ‘pits’. It is a sub-outcropping geological formation consisting primarily of degraded oil and animal bones, extending for several miles along the coast. Although rare, it is not unique. There have been many floods over at least the past 550 million years. Based on this record, and in conflict with the biblical claim above, there will be many more! The most recent flood due to impact occurred about 10,500 years ago, while the previous one occurred about 63,000 years earlier, and there is some evidence that the one before occurred only 76,000 years earlier. If there is any inference that could be taken from this, taking into account historical records, it is that the frequency of major impacts has been increasing. If an interval between major impacts of only 70,000 years or so were representative of the distant past, it is doubtful whether any large land animals would be left on Earth, including us. With every impact of this magnitude, most land-dwelling animals on Earth die. Most fossils are formed at these times, explaining why the fossil record is so discontinuous. It is not uncommon for species that are plentiful at the end of one period to never again appear in the geologic record. As the reader will have realized by now, most divisions of geologic time into eras and periods, throughout the entire Phanerozoic eon (the past 541 million years) have been due to oceanic floods that resulted from the impact of large asteroids. Oceanic floods as a result of major asteroid impacts constitute a dominant form of catastrophism affecting our planet, and the stratigraphic record attests to their recurrence, at least since the end of Precambrian time. They have repeatedly turned over a new leaf in the book of evolution, destroying the trilobites and the dinosaurs and the mammoths, and millions of species in between. The most recent flood may have destroyed more large mammalian species than any previous one. Large animals that lie preserved along the Arctic coast of North America arrived almost literally, in two waves. Each oceanic flood was the result of an axis change following a major impact. Dating of these animals’ remains has indicated they arrived about 10,500 and 75,000 years ago. There have been many floods, and some landforms required more than one flood to develop. 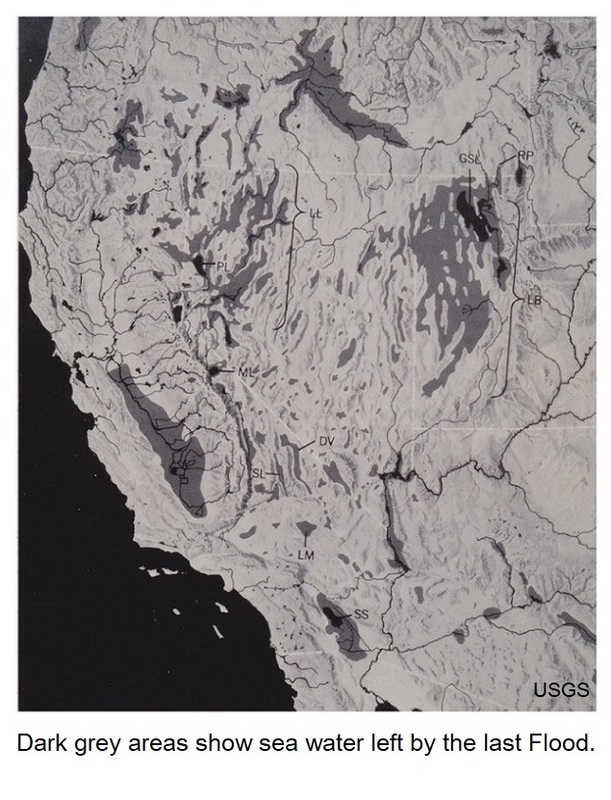 A good example is the ‘mesa and butte’ topography that has come to typify the American southwest. It’s the one with all the box canyons where the bad guys hang out in the old ‘Westerns’. A mesa has an extensive plateau on top or is connected to a ‘mainland’, while a butte stands alone. Calcrete (also called duricrust or caliche) is the bane of mineral exploration geologists seeking sub-surface samples in arid areas, as an expensive, massive bulldozer with a ripper must often substitute for a tractor-mounted backhoe. In arid regions, however, this limestone has found use where timber is scarce, as building material for dwellings and walls to contain livestock, for road building material, and even for walls to support agricultural terraces along canyons, as I have seen practiced in what is now Israel. Sediment was then laboriously carried up from the river below to provide soil to grow crops. An oceanic flood can result in the formation of calcrete as a shallow limestone bed, or sometimes an irregular bed having prominent vertical extensions. It tends to persist in a largely unaltered state, preventing the development of agriculture or most plant growth. 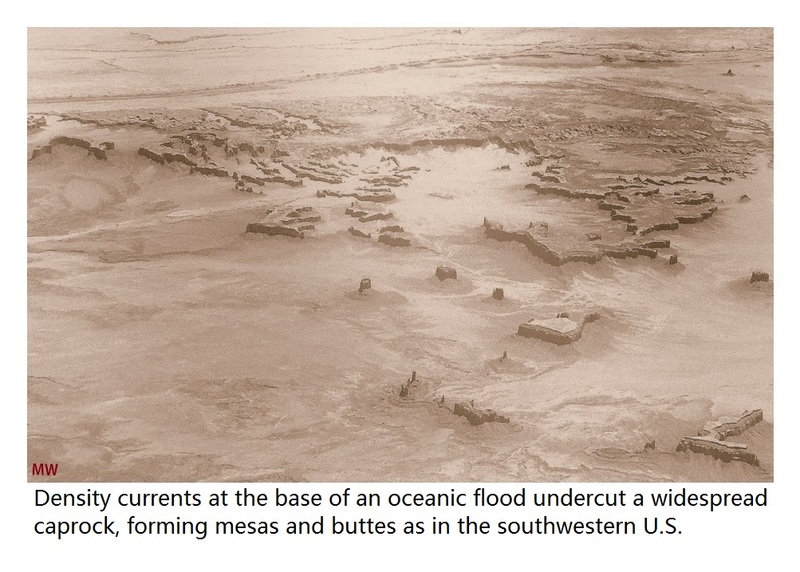 The calcrete surface may be resistant to destruction by an oceanic flood at first, but then it is attacked by density currents containing particle sizes up to boulders at the base of the flood. As the shallow calcrete layer is breached, valleys form, with tributaries flowing into them. Density currents at the base of the high energy flood undercut cliffs, which are rapidly eroded, leaving mesa and butte topography. When a waterfall in a stream, which has eroded its way back over a calcrete bed, stops flowing, a box canyon is left behind as a common feature. The extinction of Pleistocene megafauna around 10,500 years ago has been attributed to hunting pressure by native people, climatic change, disease and (finally) asteroid impact. Of course, the aspect of “asteroid impact” that has always been missed is the oceanic flood that accompanies an axis change. Just considering North America, the place was a zoo, with several elephant species, more familiar horses and camels; saber-toothed tigers, and giant versions of present tortoises, beavers, sloths, bears, and bison. A complete list would be much longer, including extinct reptiles, birds, fish, and insects. Australia underwent a similar extinction of its giants, and their remains occur in cave systems beneath the western desert. Another significant change to Australia was the beginning of the Great Barrier Reef. 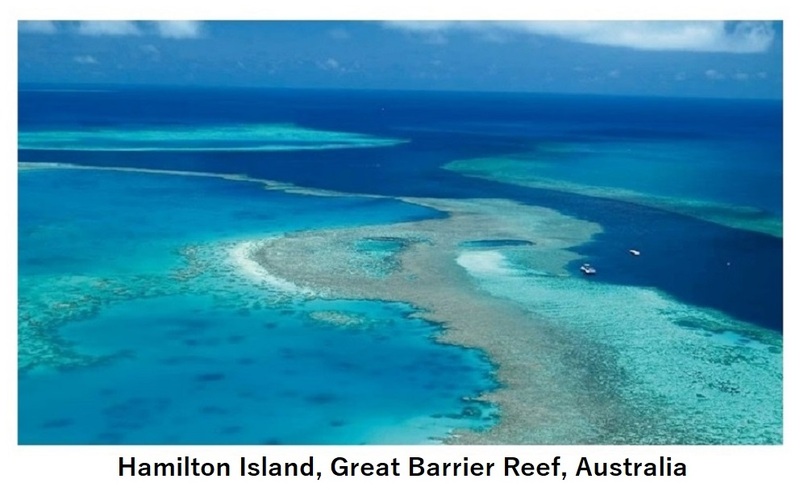 Until the most recent major axis change, the eroded shelf that was to host the Great Barrier Reef was situated outside of the tropics and may even have been above sea level. Any humans living along the Queensland coast would have been removed by the oceanic flood, but others migrated there soon after. It is remarkable that their descendants, 10,500 years later, can recount stories of the sea level rising and flooding this broad shelf which did not yet support corals. The rising sea level was due to melting ice from the shattered ice caps. Flooding of the shelf in its new tropical environment occurred, fortuitously, to an average depth of some 35 meters, which is about as deep as light can penetrate water with any strength, thus providing an ideal environment for a wide range of tropical corals. I would like to know if stories have persisted in Australia about the oceanic flood itself. The continent is known to have been populated before then, so there were either flood survivors from higher ground, or else newcomers who arrived on the continent soon after. Much of Australia has low relief, so flood waters might not have reached as high as elsewhere, even though the continent is only some 300 from the meridian of maximum latitude change. One might expect, therefore, that there are Australian Aboriginals who are descended directly from some living on the continent about the time of the axis change. If so, flood memories may have been passed down, just as they have been elsewhere around the world. 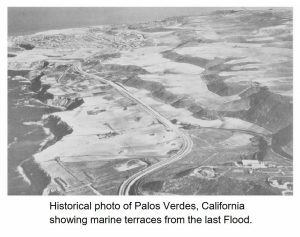 The result of this sudden drop in sea level can still be recognized today. Many of the ‘raised’ benches in the tropics are former coral reefs that were right at sea level at low tide. They are easy to recognize, so look for them on your next vacation to the tropics. 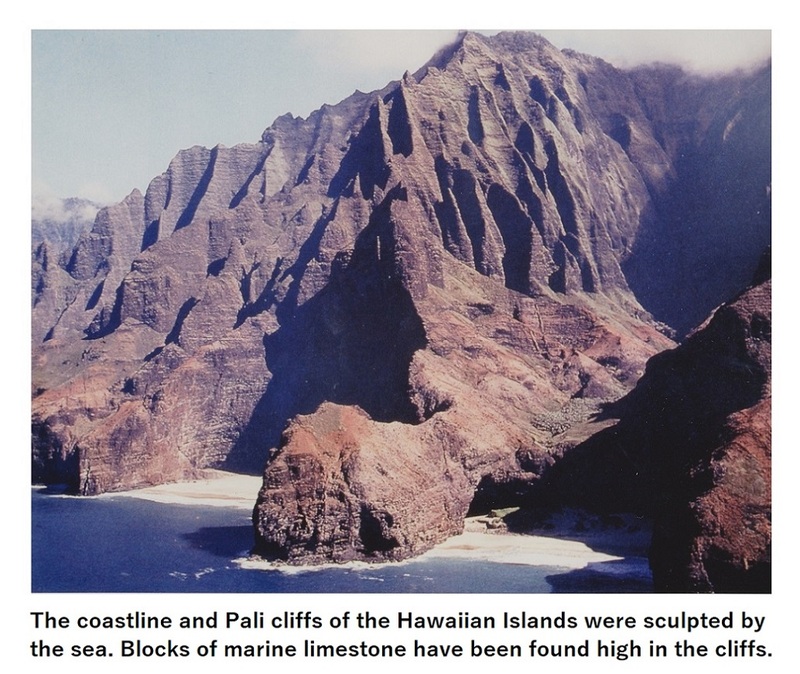 Hawaii’s famous Pali cliffs were sculpted by the water of oceanic floods that have passed completely over the lower islands, no doubt removing most animal life there each time. There are some problematic sites that will be destroyed by the next axis change. Nuclear power stations and nuclear waste and weapons dumps will be obliterated, and radioactive detritus will be widely scattered, some with half-lives of a billion years. Some of it will be deeply buried, but may still be in contact with ground-water. Another installation at risk, due to its location on Spitsbergen, 1,100 kilometers from the Geographic North Pole and 130 m (430 ft.) above sea level, is the Svalbard Global Seed Vault. A small axis change moving it southward might render it permanently inaccessible beneath the sea. Movement of the North Geographic Pole during the last axis change was twice the distance between Spitzbergen and the present geographic North Pole. The seed vault is a “fail-safe…facility built to stand…the challenge of natural…disasters.” (taken from their website.) Its stated purpose is to guarantee future crop diversity and is being partly financed by some of the world’s largest agribusiness giants involved with the development of genetically modified plants. This leads one to question the kinds of catastrophes that have been envisaged to threaten the future availability of current seeds. Axis change might not have been one of them. Most people other than scientists, associate the formation of major ice sheets with Polar Regions. Ice sheets are moved from Polar Regions to lower latitudes by axis change. 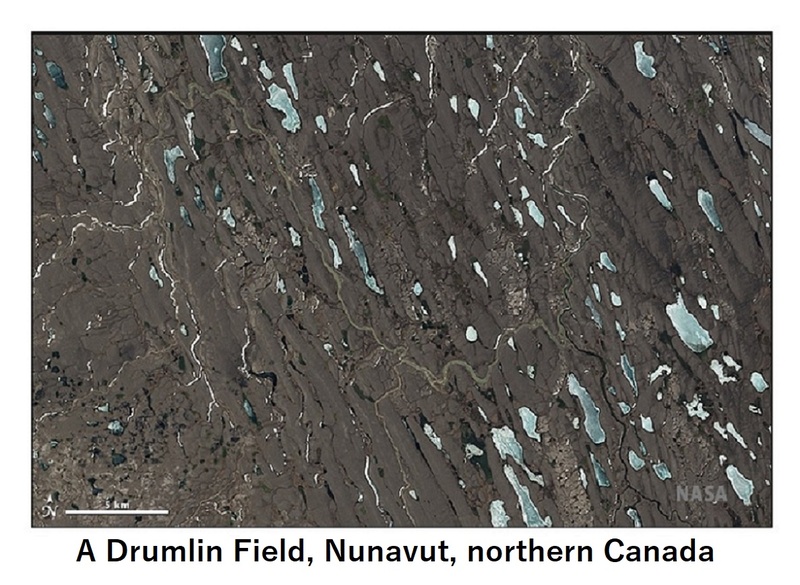 There has been much speculation by Canadian geologists about why Pleistocene ice in the Canadian Arctic moved north. At the time, however, the ice was moving south. Pleistocene glaciation in Australia is claimed to have occurred in Permian time (which ended about 252 million years ago). Glaciated outcrops on islands along the south coast of Australia, however, are just as smooth and polished and exposed as those of the Canadian Shield. Parts of South America and Africa that were glaciated in Permian time are covered with thick residual soil, and no outcrops of polished rock occur. Australia was closer to the Antarctic Circle before the last axis change, and glaciation along its southern coast, northward into the interior, occurred then. The ‘snowball Earth’ concept, described in some older geology texts, was based upon evidence of glaciation occurring at presently tropical latitudes, as a result of axis change. It is claimed that thick beds of sandstone and shale exposed along the walls of the Grand Canyon were deposited gradually over millions of years. 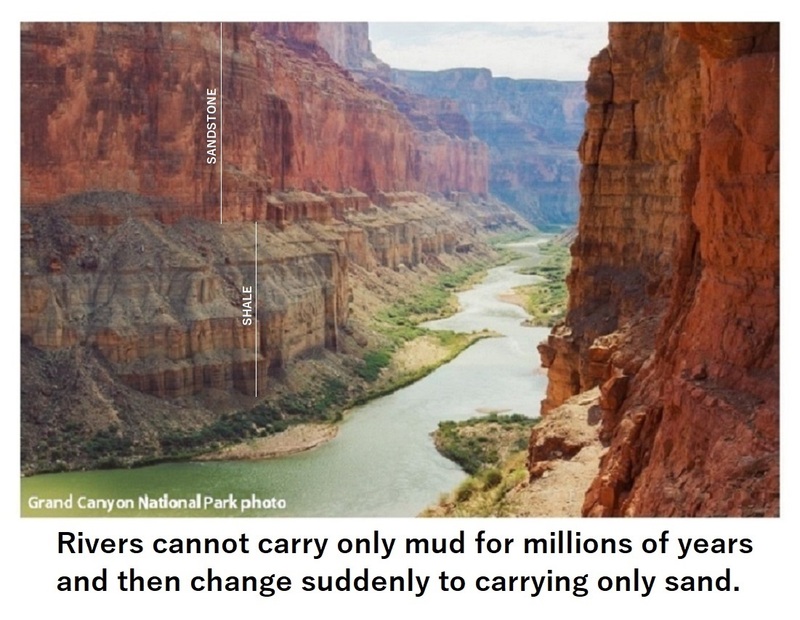 Local rivers would not have carried only mud for millions of years, however, and then changed suddenly to carrying only sand. 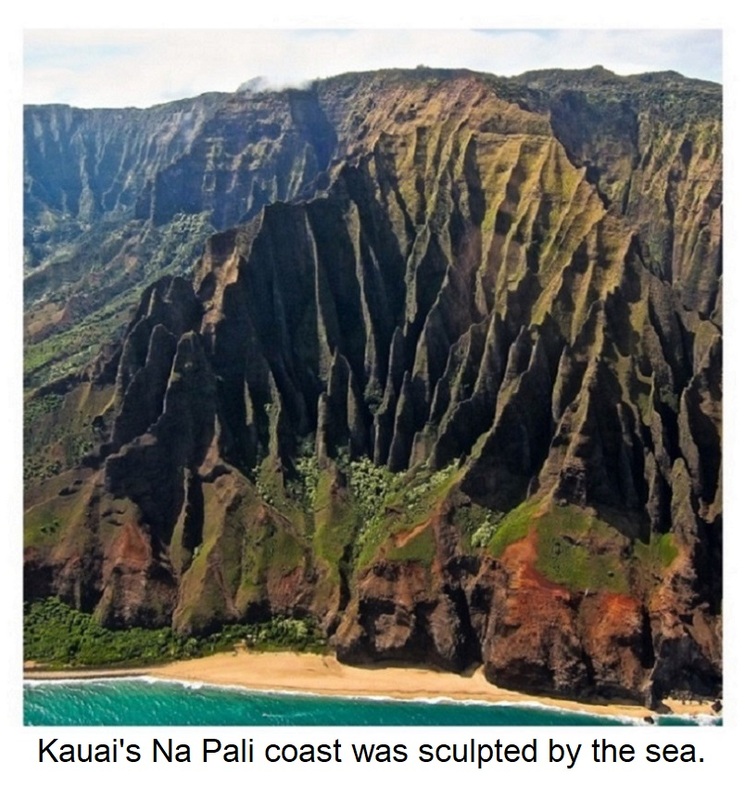 These are rapidly deposited oceanic flood deposits, as are most sedimentary rocks on Earth. 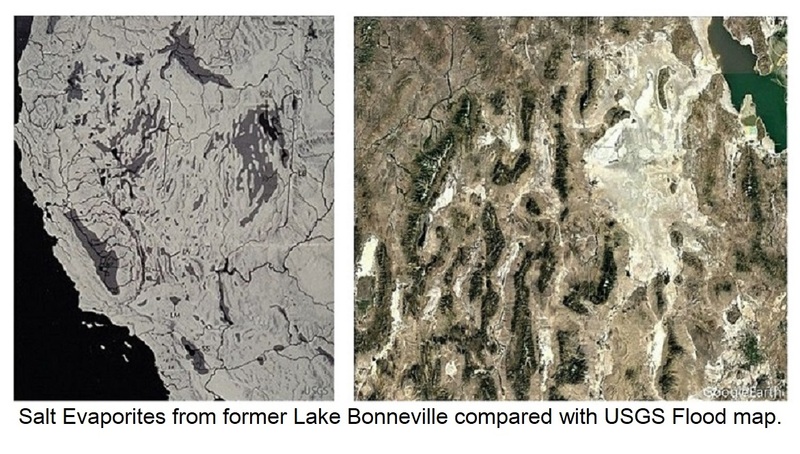 Great Salt Lake persists as a fading memory of former Lake Bonneville. That huge lake, in a notably arid climate, was not only almost 1,000 ft. (300 m) higher than the present lake level, but its outflow cut two deep canyons. Established lakes don’t have more than one outlet, and Great Salt Lake has none. In the Great Basin of the western United States, calcareous tufa (a precipitate formed by marine algae) was deposited on rocky shorelines of more than a hundred lakes, including Great Salt Lake, showing that they contained sea water. Some reflect two successive fillings, and Dry Falls, in Grand Coulee, Washington State, shows that it was cut by two successive floods. Marine life is stranded in inland lakes by every oceanic flood when every lowland basin on Earth is filled with salt water, and sometimes adapts to the new conditions. From jellyfish in Lake Tanganyika to crustaceans in Lake Titicaca, marooned species occur around the world. In the Caspian Sea, porpoises and seals feed on salmon, herring, and tuna, while in Lake Baikal, seals and sponges live together with fish from the ocean. Seals also live in inland lakes in Quebec. Whales proved to be less adaptable, but their skeletons have been found on the shores of Lake Champlain, in several dry lake beds in North Africa, within the Los Angeles Basin, and at numerous locations now far from the sea. Caspian Sea seals are so similar to Arctic seals that some scientists postulated a canal between the two regions at some time “in the past.” It was easier for them to accept a canal 3,000 km (1,850 mi.) in length, for which there is not a shred of evidence than to accept the reality of oceanic flood. River terraces result from floods pouring off a continent. Terraces along the Mississippi River have been claimed, without evidence, to have formed hundreds of thousands of years apart. It is remarkable then, that in an area of high precipitation, the highest terrace (claimed to be the oldest) is just as well preserved as the lowest. Marine terraces occur along major river valleys around the world and all are the product of oceanic flood. Some notable North American examples are the Yukon River in Alaska, the San Juan in New Mexico, and the Stikine in British Columbia. The greatest canyons on Earth lie beneath the sea, some being deeper than Grand Canyon in Arizona. Many are extensions of river valleys, formed as sediment-laden flood water returned to the sea. Others lack a land association and formed as furious flood tides were channeled between islands. Impressive submarine canyons exist between the Japanese islands of Honshu and Hokkaido, and among the Santa Barbara Islands off California. The English Channel also displays evidence of deep scouring. Antarctica and Greenland lack well-developed submarine canyons because flood water flowing off an ice cap carries little sediment, and it is sediment that causes most of the erosion. River valleys have served repeatedly as conduits for the return of flood water to the ocean, which is why river valleys are so large compared to the rivers that now occupy them. 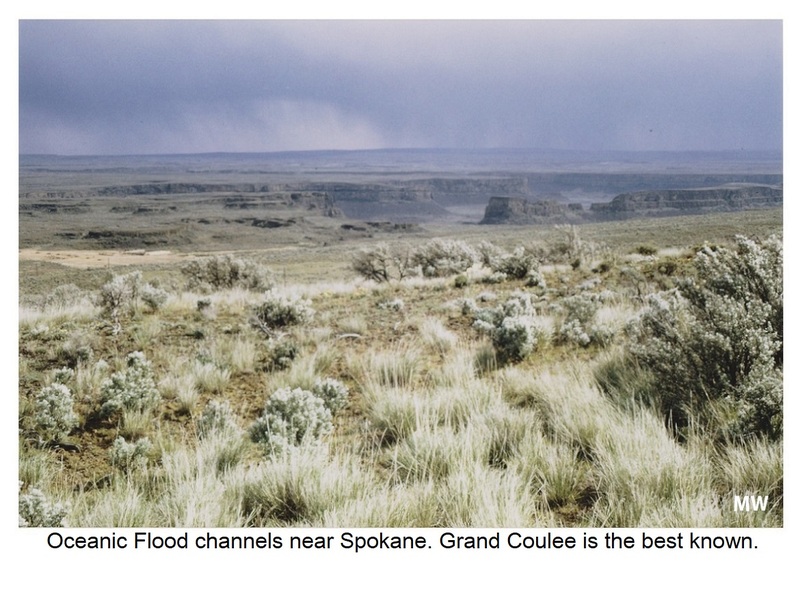 Some flood runoff channels carried off a significant part of the water from an entire continent. 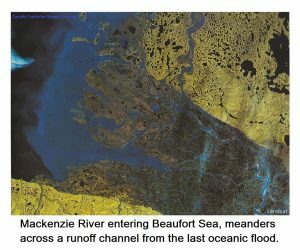 The satellite photo depicts the mouth of the Mackenzie River in Arctic Canada. 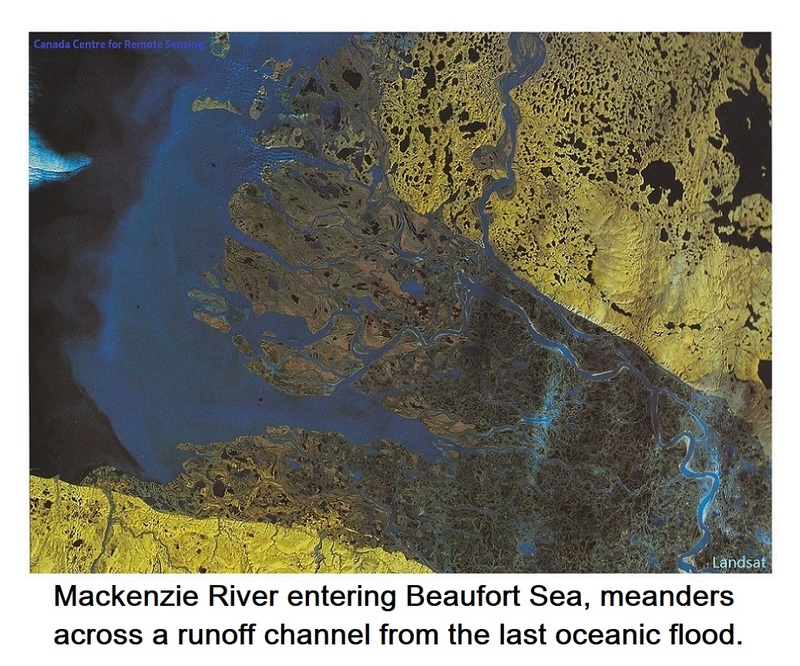 The blue meandering stream is the “mighty Mackenzie River”, as it is so often described, while the dark, cliff-bordered swath occupying the lower half of the photo is the oceanic flood runoff channel. The width of the present meandering river is less than 3% of the width of the flood channel. Animal bones of many species, mostly broken and splintered, are packed into several rock fissures in Europe. So prolific were some deposits that the bones of hippopotami have been quarried, as near Palermo in Sicily, to provide high-quality bone ash for industrial use. Some bone-packed fissures are high on steep hillsides, lacking access for large animals. Immanuel Velikovsky drew attention to this though few cared to listen. The most recent flood occurred in summer in the northern hemisphere, for some animals entombed in permafrost have flowering plants in their mouths. Some members of big game species that survived must have been on their high summer range, while others on the lowlands were swept away. The largest and strongest animals appropriate the lowlands for themselves, where food is most plentiful and the climate most temperate. Then, after they have been removed by a flood, species that had been pushed back to the hinterlands venture forth to investigate what new opportunities are available to them. Repeatedly, have the meek inherited the Earth. Humans, also, were saved by the season. 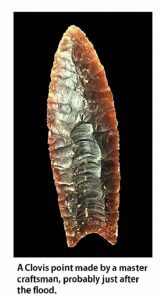 After flood waters receded in America humans came down from the highlands and skilled craftsmen again manufactured their traditional Clovis and Folsom-type spear points to hunt the elephant species on which they had depended. Those large animals were gone, however, and from then on they manufactured smaller stone points to fit their arrows. 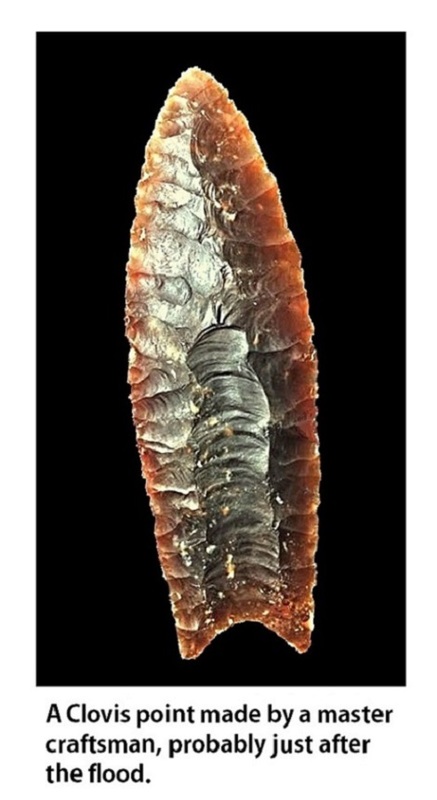 Furthermore, the claim of some anthropologists that people who made the spear points were replaced by a different race that made arrowheads would be a bit like anthropologists of the future concluding that the race that made radios died out and was replaced by a superior civilization that made television sets. People adapt to changing circumstances. Kelly and Dachille quote Indian legends indicating that many people survived the impact in the valley of Mexico City. Also, people responsible for the Folsom and Clovis points survived 1,000 miles further north, as did people who made similar points found at Wenatchee, in Washington state. There could have been other groups of survivors scattered throughout the western Cordillera. Where the waters slowed, they deposited a layer of sandy silt, as if to compensate for all that had been taken away. Enriched by plant remains over thousands of years, it constitutes our topsoil. Most agriculture on Earth is dependent upon this precious layer. Boulders of a different type than the bedrock on which they are found, and lacking any nearby source, are termed ‘erratics’. Unfortunately, the definition provided in geological dictionaries defines them as having been left by glaciers or icebergs. In fact, erratics situated high up on islands far from any mainland are most likely to have been moved there by oceanic floods. In Antarctica, the Shackleton expedition found granite boulders high on the slopes of volcanic Mt. Erebus. 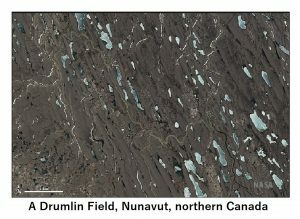 Drumlins are oriented gravel ridges, often with associated bedrock erosion, formed as deep flood water lying on a continent forced its way under an ice cap by hydrostatic pressure, quickly breaking up the icecap. Another common glacial feature in northern Canada is the ‘esker’. Once said to represent the courses of streams that flowed beneath glaciers, this was discredited by the fact that many course up and down hills. 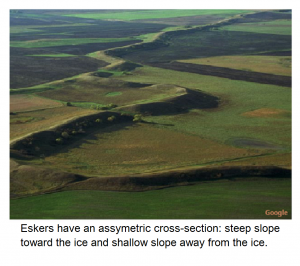 As the ice cap broke up, sediment was heaped by flood waters against ice blocks, and after the ice melted or was removed, eskers remained. They present an asymmetric cross-section, with the steeper side against the ice and the shallower side away from the ice. C. Chamberlin (1843-1928) was an influential geologist who headed the glacial division of the U.S. Geological Survey. He was a professor at several American universities and founded the ‘Journal of Geology’. He claimed to have recognized five separate advances of the ice sheet over the north-eastern United States and even gave them names that are still in use by geologists today. The earliest is known as the ‘Nebraskan’, followed by the ‘Kansan’, ‘Illinoian’, ‘Iowan’, and ‘Wisconsin’. Each accumulation of till was caused by runoff from an individual transgression of the sea. Instead of them being separated by “many thousands of years”, as Chamberlin claimed, their formations were separated by hours, and there were no interglacial stages. It used to be taught that at the end of each geological period the land “sank beneath the sea”, re-emerging as if responding to a need to breathe the air again, as the next geological period began. Water flowed onto the land during an axis change, depositing sediments or eroding them, before flowing back to the sea. The evidence left by shallow seas is very different from sediments left by oceanic floods, and I have known petroleum geologists to describe flood deposits of eroded reef material, spread evenly over hundreds of square miles, as ‘reefs’ because they contain fossils of reef-forming animals. Similarly, ‘transgressive seas’ are always the result of an oceanic flood. A normal sea advancing against the land never leaves behind smooth, parallel, sedimentary beds over large areas. Zircon crystals found distributed across the North American continent have been interpreted as being deposited by a system of giant rivers that must have existed to carry them from their Appalachian source rocks. No evidence of these rivers exists and distribution of the zircons must be a result of oceanic floods. Mammoth dung discovered in caves on the Colorado Plateau contains a floral assemblage which now occurs only at higher elevations, or at more northerly latitudes (OMNI magazine, May 1991). The south boundary of the state of Colorado is some 1,850 km (1,150 mi.) further from the North Geographic Pole than it was 10,500 years ago. 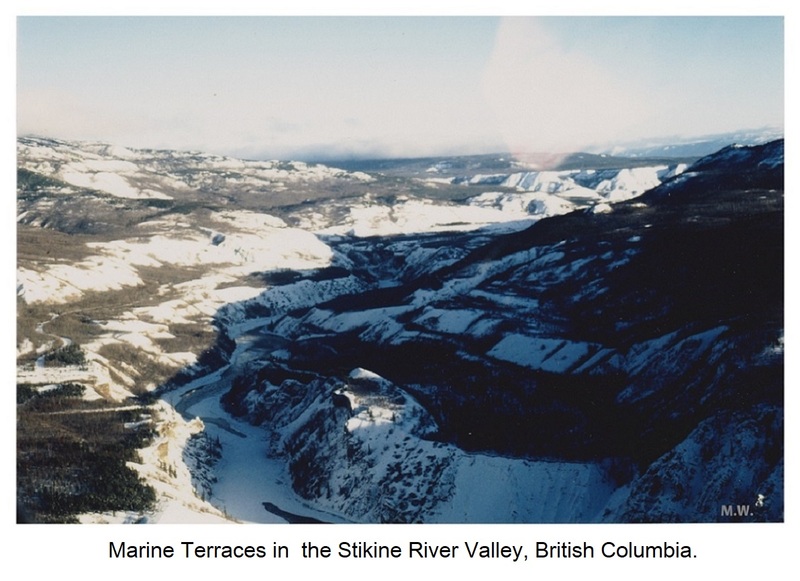 As a result, that floral assemblage from the Colorado Plateau now grows, at the same elevation, in the vicinity of Prince George, British Columbia. Marine terraces at Palos Verdes, California which mount to an elevation of 400 m (1,300 ft.) continue as submarine terraces to a depth of 150 m (500 ft.). One explanation provided for their origin is that terraces above sea level were cut by the sea from top to bottom, and the subterranean terraces were then cut from bottom to top. The only problem was that nobody had come up with a process to accomplish this. A term used in one textbook to describe what transpired is “eustatically consociated diastrophism”. When terms like this are employed it is fair to conclude that the writer has a somewhat less than total grasp on what took place. Velikovsky stated that clear writing is a sign of clear thinking. The terraces were cut by powerful longshore currents. The very highest terrace, or else the very lowest, was cut first. Then, as the ocean continued to slosh back and forth after the axis change, becoming progressively calmer, it proceeded to cut the second highest or second lowest, and so on. Gold sluicing operations in Alaska have given up the remains of many large animals. Dismembered and disarticulated, sometimes with flesh still attached to the bones, the remains of mammoths, mastodons, rhinoceroses, horses and many others lie entombed in the permafrost. They lie interspersed with shattered trees and covered with mud and silt from the bottom of the sea. Some deposits were laid down approximately 10,500 years ago, others 74,000 years ago. Human remains must lie there also for when Earth’s axis changed, only those above flood level would have been likely to survive. The final evidence I shall provide for axis change is the large number of thoughtful, knowledgeable people who over the centuries, have recognized that Earth’s axis has changed. They collected mountains of evidence for it and tried their hardest to convince others. A small sampling of this list includes G.V. Schiaparelli, William Whiston, Georges Cuvier, I.L. Donnelly, Immanuel Velikovsky, Harold Jeffreys, W.B. Wright, Charles Hapgood, Hugh A. Brown, John White, Frank Dachille, and Allan O. Kelly. A complete list would be much longer, extending back to the time of Virgil, and could include some who were ancient even then. Most claimed that the crust of the Earth slipped over its core, compared to the more plausible explanation I have offered that the entire Earth rotated about a temporary, secondary axis in response to the impact of a large asteroid. Every impact of a sufficiently large asteroid on Earth resulted in an oceanic flood. Some of the largest were also associated with something else. Great eruptions of lava commonly referred to as ‘trap rock’ or ‘traps’, occurring over extended areas, are called ‘flood basalts’. Some of these eruptions have exuded more than a million cubic kilometers of lava and tuff, accompanied by sulfurous gasses, having disastrous implications for most life. The oceans and the atmosphere are turned acidic and poisonous, leading to a collapse of the food chain. Biologists have recognized what they term a ‘bottleneck’, where a limited number of survivors share a restricted gene pool so that a species may be vulnerable to extinction even thousands of years after the event. The most likely catastrophe in almost every case is axis change due to a meteorite impact, resulting in an oceanic flood. One example is the African cheetah which is known to have passed through a genetic bottleneck about 10,500 years ago. A recognized human bottleneck occurred 74,000 years ago, attributed here to the Mt. Toba volcanic eruption and an oceanic flood that followed the Hudson Bay asteroid impact. North America had cheetahs as well, but they went extinct at the time of the flood, although they may have left behind a hint of their former presence. It is well established that healthy predators and prey tend to have similar top speeds. The pronghorn antelope, however, easily outrun any present predator, and it is supposed that they were hunted by cheetahs before the flood. The cheetahs went extinct in North America, while the pronghorns survived. The greatest known mass extinction after the end of Precambrian time occurred at the end of the Permian Period, some 252 million years ago, which was probably associated with the formation of the ‘Siberian Traps’ of eastern Siberia, situated on the opposite side of the world from Africa. A later event formed the ‘Deccan Traps’ of India, which are associated with a major impact (the K-T Boundary) responsible for the collision of India with Asia. Every flood basalt event, as well as some of the largest volcanic eruptions, has probably been in response to a major asteroid impact. The popular connection between dinosaurs and deserts is largely due to their bones being most easily discovered there as the sand is loose and blows around readily. Dinosaur remains are known to occur almost anywhere on Earth. Large groups occurring together cannot be taken as proof of the animals having lived in groups, or even having lived near to that location. Nesting colonies, of course, are proof of both. This is the study of the magnetic properties of volcanic rocks, especially their ‘remanent magnetism’ (natural permanent magnetization). It provides information on the position of the closest geomagnetic pole when volcanic rocks crystallized, as well as the intensity of the geomagnetic field. It has lately become popular to add ‘magnetic reversals’ to the terrors that threaten us. Under this scenario, Earth’s magnetic field would disappear, leaving us unprotected from the lethal effects of radiation from space. This concept was developed after a study of reversed magnetism of rock stripes that parallel the mid-Atlantic ridge. Happily, the situation has been misread, as past axis changes have resulted in volcanic rocks with their crystals aligned to whatever geomagnetic pole happened to be closest at the time of their formation. Sometimes it was the north geomagnetic pole, and sometimes the south. There is no evidence that Earth’s magnetic field has ever reversed, or that it is ever going to. The strength of Earth’s magnetic field increases after each axis change then decreases slowly over following millennia as the magnetic poles draw closer to the geographic poles. Magnetometer and gravity surveys over the actual site of the ‘Chicxulub impact’ might reveal evidence of the impact site preserved in the mantle. The site is close to the Cayman Ridge, and some 700 km away from the surface site near the town of Chicxulub on the Yucatán Peninsula. It is interesting to consider this quote taken from a Wikipedia article entitled ‘True Polar Wander’: “Data indicate that the geographical poles have not deviated by more than about 50 over the last 130 million years…” So much for ‘data’. It is not unusual for scientists to make extravagant claims for some pet theory, in the absence of any credible support. A favorite claimed confidence level is 99%. In his 1991 book ‘Extinction’, author David Raup has the following to say about the effects of large impacts. “The predicted effects of large impacts include shock waves, tsunamis (tidal waves), acid rain, forest fires, darkness caused by atmospheric dust and soot, and global heating or global cooling.” He evidently wrote down everything that occurred to him at the time, but do you see what is missing? Only axis change, which can produce worldwide volcanism, oceanic floods that can destroy most individuals of higher forms of life over entire continents, and changes in latitude that can make the resultant climate unsuited to the reestablishment of former ecosystems. 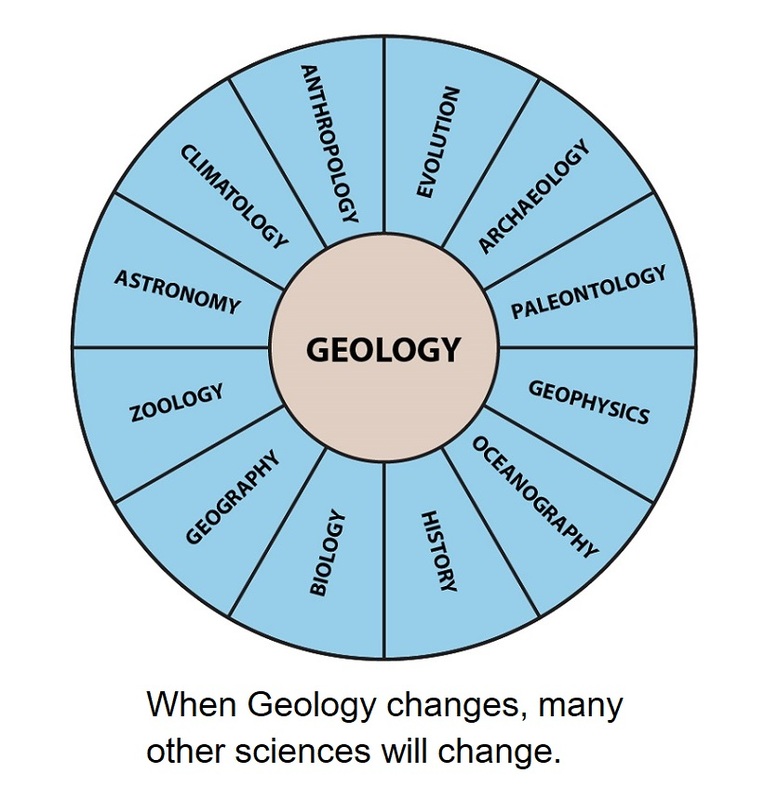 Ignorance in geology has distorted every science with which it has come into contact. 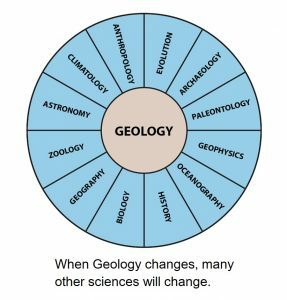 When geology changes, fundamental beliefs in sciences often thought to have little in common with one another, from astronomy to zoology, will all change.